The shaker features a non-slip rubber mat perfect for securing culture flasks, petri dishes, and staining trays. Benchmark has also designed their Incu-Shaker Mini for compatibility with the MAGic Clamp Magnetic Platform. The MAGic Clamp system allows users to select a variety of MAGic magnetic attachment clamps that can be instantly exchange without the need for any tools. MAGic clamps allow users an extra level of security since the clamps are specifically designed for the corresponding laboratory vessel. Compact Footprint – Only 11” x 15.7”! Large Interior – 11.5” x 9.5” Interior Workspace! Do you need a larger shaking incubator? The Incu-Shaker™ 10L is a heavy-duty shaking incubator holds up to 49 X 50mL flasks. 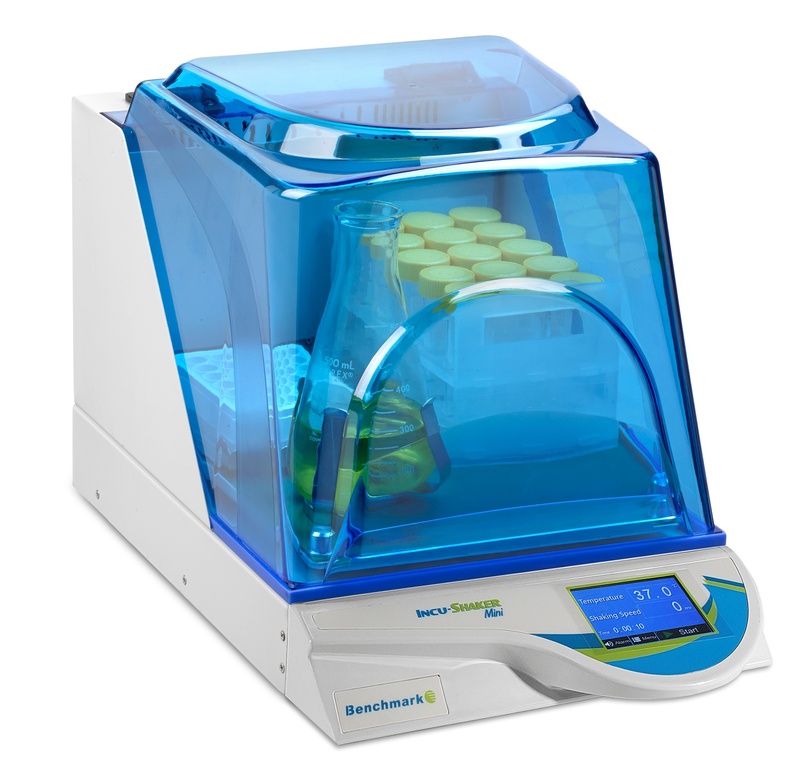 Incu-Shaker™ Mini Shaking Incubator is Compatible with MAGic Clamp™ Platform and Accessories. The Incu-Shaker Mini Shaking Incubator features a touchscreen control panel. The large display, with touch capability, allows users to easily change and verify settings with gloves on, and to monitor the current settings clearly and easily. 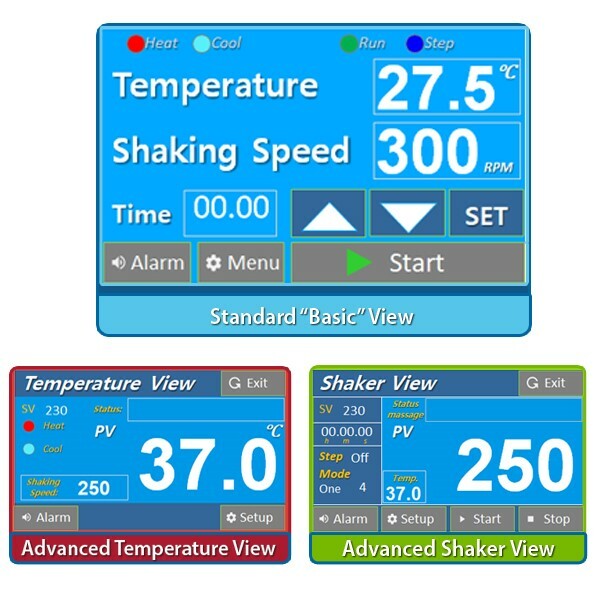 The software includes a basic view with shaking speed and temperature monitoring/control, but also features an Advanced Temperature View and Advanced Shaker View. Each Advanced View allows users more control, more access, and more versatility over the aspects of their experiment and shaker. The touchscreen technology makes operation and data logging much easier and more thorough than ever before. The Benchmark Incu-Shaker provides a large 11.5” x 9.5” workspace with plenty of room for flasks, tubes, bottles, and other common vessels. 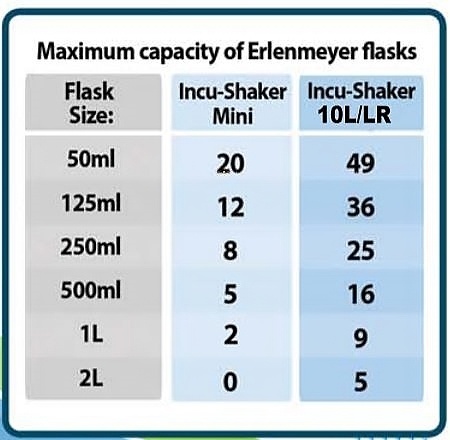 The dimensions allow for even up to 1 Liter flasks! 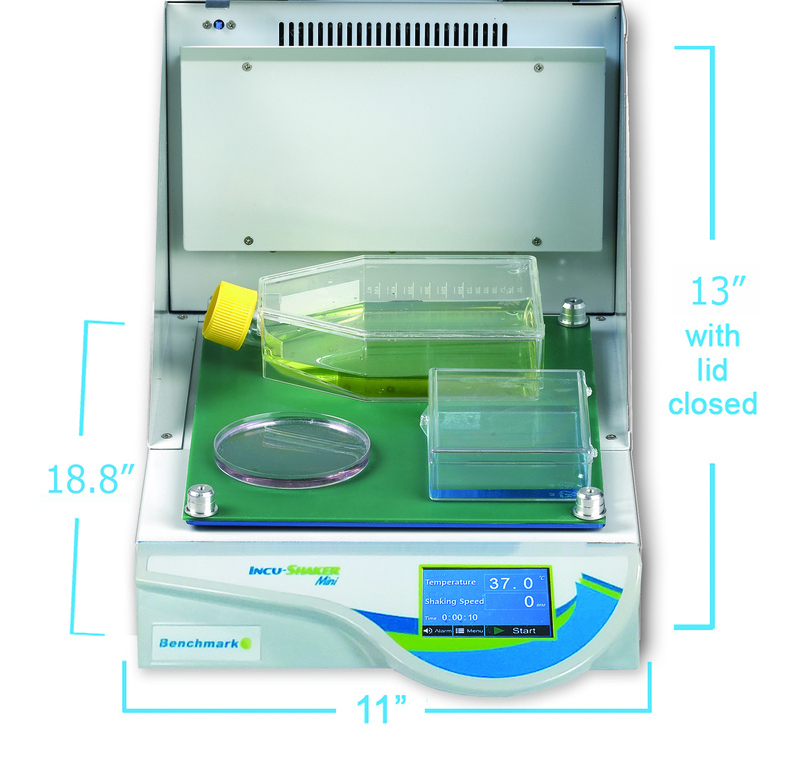 However, despite that extensive interior, the mini incubating shaker only takes up 11” x 15.7” of benchtop space. The extreme compactness of the incubating orbital shaker’s housing means that users can easily fit it on to their own or communal benchtop without disturbing equipment already there. Benchmark engineers carefully constructed the Incu-Shaker Mini with the hardware and software to verifies and maintains accuracy of operations throughout all usage. Every one of these mini incubating shakers is equipped with a microprocessor that allows the device to constantly monitor settings for as long as the machine is operating. 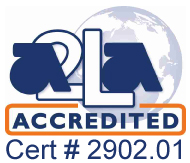 This ensures that the temperature, speed, and run time that the user sets is carefully and accurately instituted, so that experiments can be consistently and reliably performed. Users can choose to purchase and equip their Benchmark Incu-Shaker Mini with a MAGic Clamp Universal platform. MAGic Clamp is a special technology developed and deployed by Benchmark that allows users the versatility of using extra-secure magnetic attachments with their incubating orbital shaker. The magnetic attachments can be easily switched out without the need of tools and come in a variety so that users can quickly and securely use their mini incubating shakers with a variety of experimental vessels in combination. 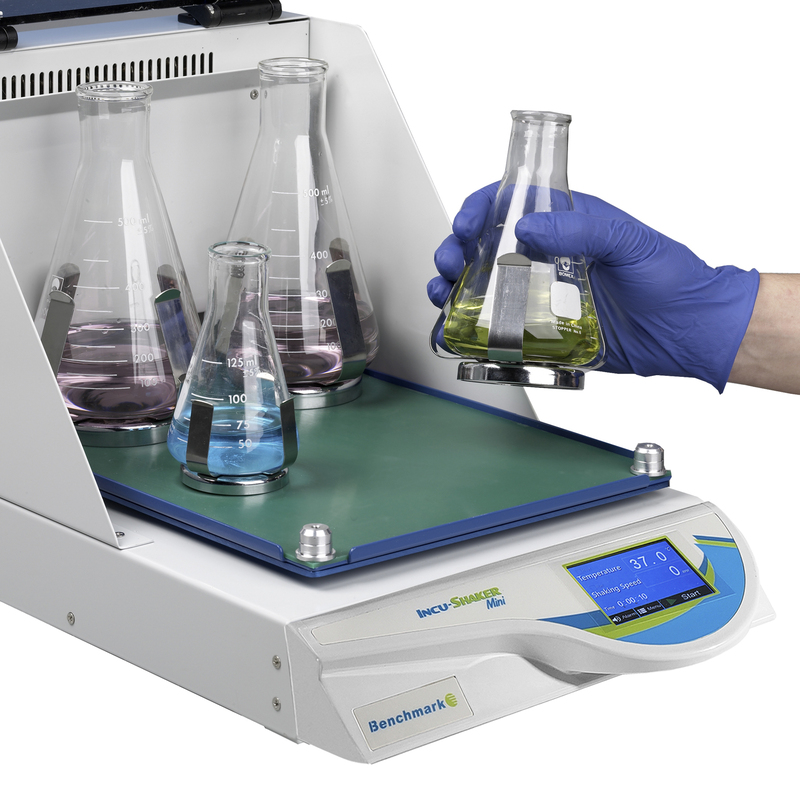 The standard platform on every Benchmark Incu-Shaker Mini features a non-slip, rubber coated surface ideal for securing culture flasks, petri dishes, and staining trays.